Disneyland Paris is host to a lot of hotels. Six on-site Disney hotels, one off-site Disney hotel, a holiday park (Villages Nature), nine partner hotels and numerous nearby hotels. Choosing the right hotel can be a hard task. As Annual Pass holders we have stayed at several hotels at Disneyland Paris, but also nearby. After each visit we write a review or update an existing one. Each review contains photos and a clear description of what you can expect at the hotel. If you have any questions, or would like us to stay at a specific hotel, please reach out to us. Disneyland Hotel For the ultimate in luxury and unique experience, Disneyland Hotel is situated at the entrance of the park with stunning views looking out towards the hub and castle. The hotel pays homage to the Victorian style which can be seen in the large foyer and grand staircase of the lobby. The soft pinks and green pallets continue into the rooms. The restaurants also reflect the grandeur of the style with the exceptional Inventions character buffet and the playful piano bar lounge. Disney’s Hotel New York The smallest of the three hotels at Lake Disney, Hotel New York provides the intimacy of a luxury hotel at a lower cost. Set in the theme of New York City, the hotel throws in every New York cliche you can imagine from the New York apple, to the love of American baseball. The lounge offers specialty drinks featuring American bourbon. The large indoor/outdoor swimming pool is a perfect way to spend some time away from the parks as well as the tennis courts. Click here to read our review and see room photos. Disney’s Newport Bay Club Situated at the end of Lake Disney, Newport brings you into the world of New England full of nautical decor. The nautical blues, whites and golds transport you to a beach side resort. Families can enjoy the large indoor/outdoor pool or enjoy the seafood themed buffet at Cape Cod. Click here to read our review and see room photos. Disney’s Sequoia Lodge Nestled between New York and Newport Bay, Sequoia Lodge is brings guests closer to the great outdoors and pays homage to famous American lodges set in the wilderness. The hotel is surrounded by giant sequoia trees providing rustic and quiet surroundings. After a day at the park, guests can enjoy the indoor pool with a slide for all ages, or have a drink at the Redwood lounge opposite the open fireplace. Click here to read our review and see room photos. Disney’s Hotel Cheyenne Join Woody and gang at this western theme hotel. 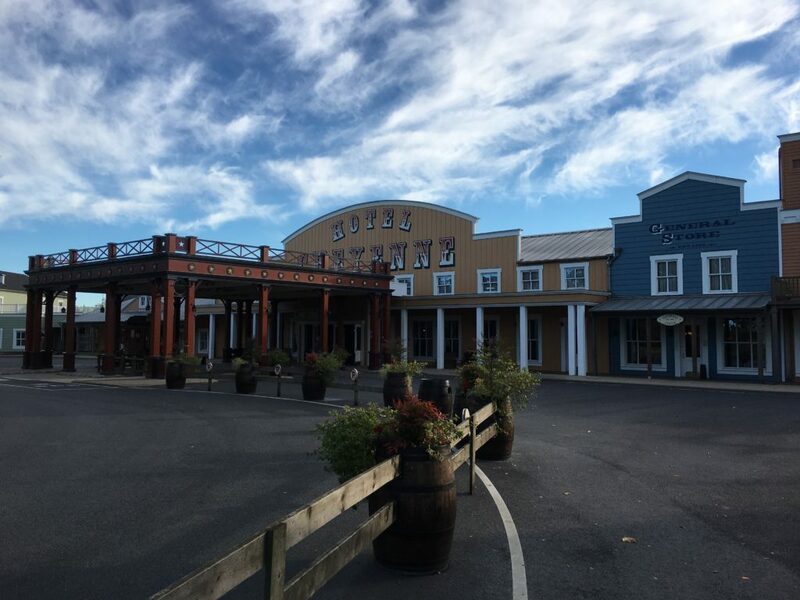 The more budget friendly hotel on property featuring 1,000 rooms, this hotel is spread out into 14 various two-story buildings named after famous western heroes and villains. Rooms are themed with Sheriff Woody and friends providing a playful yet sophistication of the western theme. At the end of the day, enjoy a drink at the saloon or sit outside on the deck and enjoy the stars. Click here to read our review and see room photos. Disney’s Hotel Santa Fe For Cars fans, Hotel Santa Fe provides a budget friendly hotel that will have you ready to discover the lands along US Route 66. With 1,000 rooms and 40 uniquely separated buildings, you won’t have to worry about neighbors in this spread out resort. There is always something to find as you explore route 66, from the famous volcano and alien encounters. In the main building you will find all your amenities, from breakfast buffet, the boutique and the cantina. Click here to read our review and see room photos. Disney’s Davy Crockett Ranch For those who want to get away from the hustle of the parks, Davy Crockett Ranch is a 15-minute drive from the parks and provides a more rustic and calm setting. Individual cabins are spread throughout the property providing a parking spot and an outdoor deck to enjoy your home cooked meals. Fun for the whole family can be had at the indoor heated pool. Or explore the outdoors at Davy Crockett’s Adventure, mini-golf or tennis. Click here to read our review and see room photos. 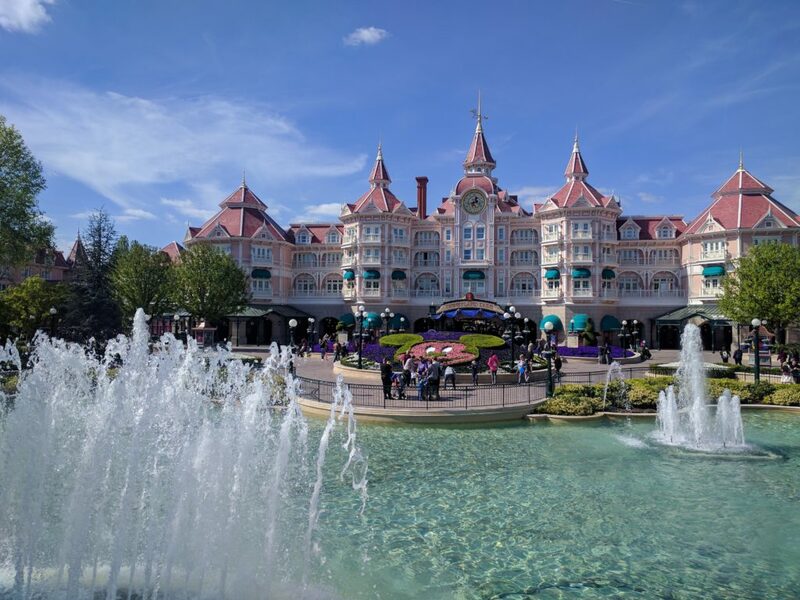 Partner hotels work with Disneyland Paris and often offer a shuttle service to and from the parks. Tickets to the parks are not including in the price, unless this is specifically mentioned. Guests of Partner hotels also do not have Extra Magic Hours. Tickets to the parks are not including in the price. Guests of these hotels do not have Extra Magic Time. Some of these hotels are close to public transport, meaning you can leave your car at the hotel and save the parking fee. For other, you have to drive 10 to 25 mins to get to the parks.